Smartcard News Blog: There is no ID Card or Identity Register, what Next? Driving Licence! There is no ID Card or Identity Register, what Next? Driving Licence! Well we knew it was going to happen if the Tories got into power and yes in the Queens Speech this month the ID card is top of the list of things to go. Now of course, can you believe it, people are actually saying it won’t save much money but human rights and all that will be preserved. There are even plans to reduce the number of CCTV cameras around the land but I’m personally far more interested in those yellow boxes and more particularly the camera tripods operating out of the back of a van. Not for one minute would I suggest breaking speed limits but sometimes, change that too often, they are just in the wrong place. Sited to catch you unawares with little danger to others, in fact the last one I saw was literally 50 yards before the end of speed limit sign on a hill well past the occupied land. It was only 36 miles an hour but that was enough to get the summons and I’m sure my other half now appreciates better the dangers of speeding. He elected for the speed awareness course and did actually come back saying it was worth while albeit it took the best part of a day to get there and back. But now there is no ID card or Identity Register what next? Well for some time we have preached about the humble driving licence, in the UK at least and probably still in America now that they have the counterfeits under better control, it is a pretty basic but none the less effective ID card. In fact I don’t know about you but in general this is the document that I use the most when somebody asks for proof of identity and that is not just in the UK but also Europe more generally and North America. It’s a convenient size and provides all the information the challenger requires and if you were to put a chip on it (sorry probably in it) then what else would you need? The last time I raised this at a dinner party there were screams from the non drivers around the table, am I unique in knowing so many people that like to be driven by others? Anyway sanity ruled even after a delicious bottle(s) of Chianti and eventually it was agreed that there was no difficulty in applying for a driving license whether you drive or not. I’ve notched that one up for posterity! And when it happens, not if, just remember you read it here first and just for the record my optimism is flavoured by the fact that the DVLA is in my view one of, if not the most effective service centre in the UK government! Perhaps it has something to do with living in Wales? The other bit of interest this month was the excitement surrounding the Oyster card, which bit I can hear you saying. Well the BBC decided to do a Freedom of Information attack on Transport for London (TfL) and shock horror they discovered that TfL have £30 million stashed under the carpet every year from unclaimed or lost card value. Apparently a total of 16.5 million cards sat idle during the financial year 2009/2010 with an average amount on each card of £1.80. There’s more, last year 31,000 Oyster Pay as you Go (PAYG) were issued and topped up but never used with a total value of £246,000. What would you do without the tourists? Now the really interesting point here is that the wheel keeps going around, when the family and I first got involved with smart cards (yes it was and still is a family affair) the electronic purse was all the rage and this was back in the late 70s and early 80s. The business case was all about the Float, that pot of gold accrued from the total prepaid and unspent value that the operator could invest to his financial advantage. This is of course true for any prepaid scheme Oyster card, iTunes card etc. But the other thing we knew all those years ago is that not all the value would be taken back, people would lose the cards, tuck them under their pillow or do all those other things we can’t mention. In fact we predicted back in those golden days that 2 – 4% might be an expected and that this escheat as it was called could be a lucrative business. However there is one little snag, unless you have an expiry date on the card you can’t really claim it because the liability always exists. Guess what? There is no expiry date on an Oyster card, who on earth left that out? We may have been throwing the baby out with the bathwater. It is possible to have an ID card system without the National Identity Register. Germany has just such a system; indeed German law says it is illegal to keep records of card usage. Obviously a database is needed of the basic card data so that cards can be reissued if lost, stolen expired etc. It is less clear if it is necessary to have biometric records of the sort beloved of the IPS. Most of us opposed to the system that is to be scrapped were against a database of usage, not the cards themselves. The government insisted that all records of usage were kept forever, and could be interrogated by nameless and faceless snoops without the cardholder knowing. It is this unjustifiable Orwellian aspect of the proposal that was so hated. In fact, the National Identity Register would never have had many entries, as there was no budget for buying terminals, and the private sector was not interested in paying for a terminal plus 70 pence a time to verify individuals were who they said they were. There are cheaper and more effective ways of doing this. Even other ministries, who were all intended to equip themselves with terminals to check citizens’ ID, sat on their hands and refused even to think about changing their systems to interface with the NIR. So we may all have been making a fuss about nothing much. The real problem was that the IPS wanted to be the arbiter of identity. In its dreams it was the only supplier of identity cards, and the only decider of who a person really was. It wanted to interpose itself in every transaction where one party wanted anther party to prove that he was who he claimed to be. The public did not like such an approach, especially as the system was to be implemented using a design that would have looked old fashioned in the 1980s. For this the many consultants they employed should hang their heads in shame. It should also be noted that the UK ID card addressed very few current problems of identification. In particular it offered no help in verifying identity online. A strange omission. So why not use the driving licence, which does not have an Orwellian image to it, and most of us already, have? First, to deal with the issue of non-drivers. In California, anyone can get a driving license as a means of identification; it clearly states that it is not a driving license, but only a means of ID. This could be done easily in the UK. 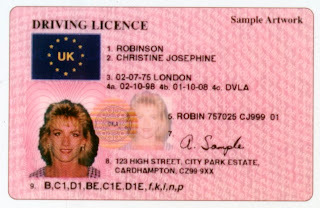 Note that the driving license has an address on it, which the national ID card did not have. Most importantly, it is missing a chip. The chip on the national ID card was an RFID chip (not known for high security). The shiny gold contacts on the front of the card are just artwork, they are not connected to anything. But the driving license does not have one of these. So the question that arises is whether you need one for an effective and reasonably unforgeable card. The chip is there primarily to contain biometrics. So there are at least two questions: is it OK to put the address on a card used for ID, and does the card need a chip, or is it secure enough without? A await at how field is changing our lives and the fill down all that life-changing foul. I think ID card is a most important part of all human's. One of my friend has suggested the idea of a common card instead of ID card to work all around like debit , credit card, college card etc.Since it was not practical that's why he could not implement.